When it comes to the VHS video format I’m personally not a collector. I have a few, here and there, but as far as collecting them I don’t have the time or the money. I used to, and had far too many to count, but that was back in the 80s and 90s when video stores actually stocked videos. As far as collecting them now though, I can totally see the appeal, and if I didn’t have other collections I would probably be tempted. As it is, I tend to pick up titles that I know friends want, and mail them to them. Hey, I’m like that. Adjust Your Tracking: The Untold Story of the VHS Collector takes a good hard look, with a large dose of humor and affection, at those that do collect this format, and we are talking serious collectors. Collections are browsed, the appeal is put forth and rooms are taken over. There is that nerdy geek factor to any collection or collector, whether it is VHS, Vinyl or Laser Discs, that’s just par for the course; most of us are geeks about something. What is interesting is the lengths that collectors will go to get the titles they desire, the networking involved and the passion behind it all, and passion is really what it is all about. Whether it involves setting up a video store in the basement, paying well over $600 for a tape or dividing the collection into genres and sub-genres, there’s an overriding love of the format on display here. Why should we be surprised that a tape is sold for $600, especially when Fright Night on Blu-ray is often seen for sale at well over $300, and I myself have sold movies for well over $200 each? It’s all part of the game that we play. Some documentaries are an intrusive, and often derisory, look at whatever subject they are covering, especially in niche circles. Adjust Your Tracking, however, is obviously made by fans for fans, and this shows in the lovely little touches throughout the film. Hell, some folk probably don’t even know what ‘tracking’ is! Don’t worry, you’ll always have Google to help you out. 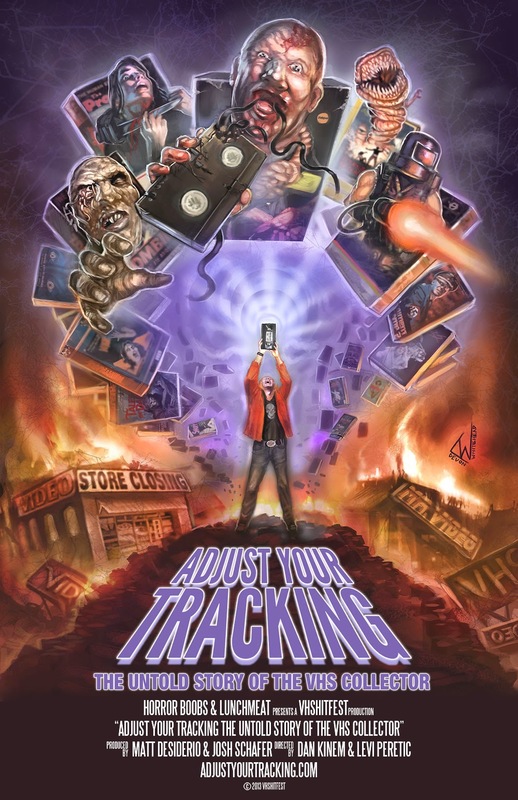 Whether you are a collector of video cassettes or not, Adjust Your Tracking is a quite wonderful film, and a must see for all fans of cinema related geekdom. I’ll be grabbing myself a copy, on a yet to be determined format, in the very near future I hope. In the meantime, keep your eyes open, especially in the thrift stores, as you never know what hidden gems you might find. For more information about Adjust Your Tracking, check out the film's Official Site and Facebook Page.